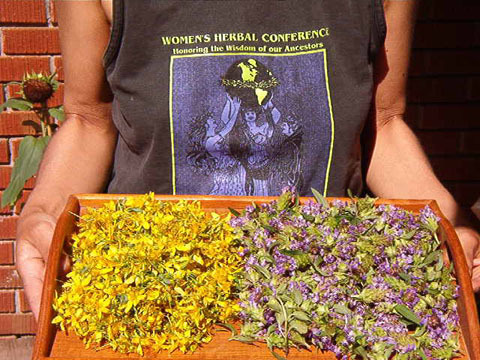 Please join me in August at the Women’s Herbal Conference in Keene, NH for an inspiring weekend. The Guilde des herboristes voted to honour and celebrate the wonderful and beautiful St. Johnswort (SJW) this year, a timely honour considering its threatened position in the province with legislation that could take it off the shelf and stamp it with “behind the counter” status. (Be sure to voice your health choice concerns loudly!) SJW is a valued weed that grows in sunny locations next to other favourites like dandelion and yarrow, and if you can identify it you can then prepare it yourself for future use when it may not be so readily available. It usually blooms right around June 24th, St. Jean Baptiste day (hence its name). Look for bright yellow flowers lining the highways and fields around Quebec. The flowers remind me of a burst of sunshine, radiant yellow, but the leaves are probably the best way to identify this herb. Hold a leaf up towards the light and notice the “perforations” throughout the leaf. Identifying these pin-prick sized glands on the leaf is a great way to ensure that you’re not weeding SJW out of your garden before it blossoms into a nourishing ally. St. Johnswort is one of my favourite plants. As you pick the yellow buds and flowers your fingers get stained dark red by the hypericin . And when you add your harvest to an alcohol or oil base, it’s quite magical how these very yellow flowers turn the menstruum crimson red! Your medicine will probably be just as strong if you include some of the leaves that grow around the blossoms so feel free to clip the upper 2-3 inches of each flowering stalk for your herbal preparations. SJW has received a lot of media attention in the past decade or so. More than thirty double-blind placebo controlled studies world wide have shown a positive effect on a variety of symptoms including anxiety, mood swings, sleep problems, irritability and depression. Known for nourishing our nervous systems, SJW is an outstanding and dependable remedy for S.A.D. (Seasonal Affective Disorder) and mild to moderate depression, without the common side-effects of antidepressant drugs. SJW seems to best help those who have no energy to get out of bed in the morning and those who feel as though they’re dragging themselves around all day. These moderately depressed individuals generally prefer to be alone, and their messy surroundings sum up their “who cares” attitude. SJW seems to dispel the fogginess in their brain and balances mood swings by adding a little sunlight to their grey world. I like the mid-winter lift I get from my favourite cordial, Soaring Spirit. I simply infuse the St. Johnswort flowers and buds, for at least six weeks, in sambuca (or any other delicious liqueur (peppermint schnapps is also delectable!) that is at least 40% alcohol, Then I strain the alcohol menstruum into a dark bottle, discarding the spent herb.. I take 20-40 drops whenever I feel I need a lift, or after a few sunless days in a row. The biggest problem, my friends tell me, is stopping after a few drops! Compliance is good when you treat yourself! If you are already taking pharmaceutical drugs check with your health care practitioner before indulging in SJW in order to avoid any complications. If you macerate your SJW in olive oil and let it sit in a dark place for six weeks, you can make a relaxing magenta red massage oil for stiff and tired muscles. The oil is also an effective remedy for shingles, chicken pox or herpes due to its antiviral active ingredients. The SJW oil can also be applied to cool off burns, whether they are from the kitchen, the sun or radiation treatments. Interestingly, one of the often-mentioned side effects of SJW is that it makes skin more vulnerable to sunburn. This seems to be the case when the various plant constituents are extracted and processed into a capsule or pill, but it rarely occurs when the whole plant is used in herbal preparations. Another way to use your SJW oil is turning it into a salve, or lip balm. Gently heat your SJW oil in a thick–bottomed pot over a low burner or flame. Add about 1 tablespoon of grated beeswax per ounce of oil. Place a spoon of oil in the freezer for a minute or two to check the consistency. Adjust as necessary, adding more infused oil it it’s too hard or more beeswax if it’s too oily. I often add chickweed, plantain or comfrey along with the SJW to this healing oil for chapped lips, dry skin, bug bites, burns, cuts or abrasions. The next time you suspect that you have found SJW in an open field, or along a sunny path check for the “perforations” on a leaf. Simply enjoy the beauty of SJW this summer or harvest some to make one of these preparations…especially the elixir, using your favourite liqueur, for those shorter days in February when your spirits need an extra lift! Find out more about this medicinal herb on Sunday, June 27th when SJW is celebrated throughout la belle province! Over the years I have been blessed with many inspirational teachers. I thank them for sharing their wisdom through their lectures, workshops, websites and books. I’m especially grateful to Daniel Gagnon for his insight on the Nervous System at the 5th International Herbal Symposium differentiating St. Johnswort’s specific applications. For more information about SJW and many other herbs, enjoy these insightful and informative resources.